'Thomas Almeroth-Williams adds vibrant colour to the landscape of Georgian London through his cast of horses, jackasses, livestock and watchdogs large and small. 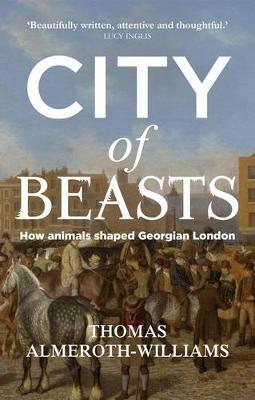 Beautifully written, attentive and thoughtful, City of beasts is alive not only with the sights, sounds, smells of the eighteenth century metropolis, but also with its animal voices.' Lucy Inglis, author of Milk of Paradise 'Animals made eighteenth-century London work. From guard dogs to drays, they provided the 'horse power' that made society turn. Almeroth-Williams interrogates a lost world of human-animal relations to expose something quite new. This book will change how you see the pre-industrial world and every mutt you meet on the street.' Tim Hitchcock, Co-Director of The Old Bailey Online -- .